« Who Hates Aldous Huxley’s First Wife? 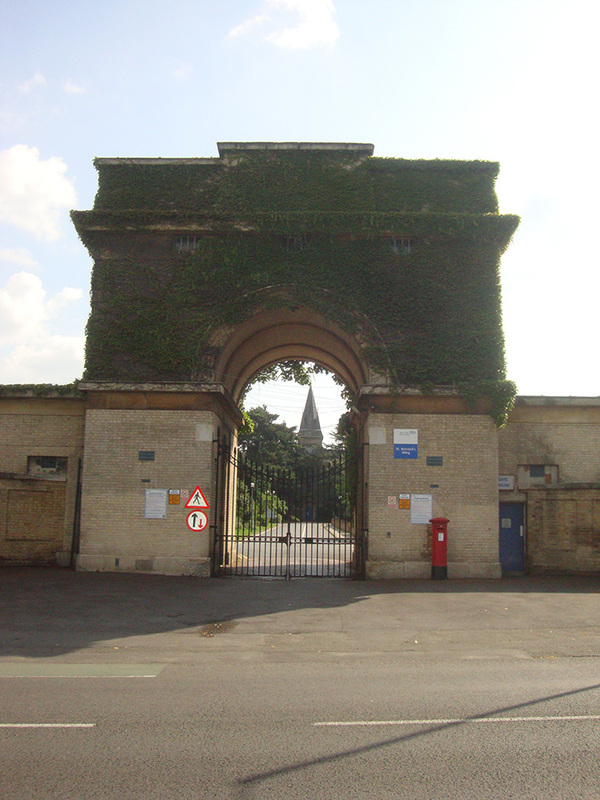 The Hanwell Asylum, aka the Middlesex County Asylum, is probably better known – if at all – as St Bernard’s. For some reason, I thought it was long-closed, like the Holloway sanitorium in Virginia Water. Or at least moved away like the Bethlem Hospital (“Bedlam”) in Lambeth, now the Imperial War Museum. The Hanwell Pauper and Lunatic Asylum. Not a bit of it. While out and about yesterday, we popped in to where we knew it to be, mainly to see – out of curiosity – what buildings remained. We quickly discovered two things: first, St Bernard’s Hospital, part of West London NHS Mental Health Trust is very much active. There were small numbers of patients hanging around on garden benches and wandering about. Some kept each other company. Quite a few were smoking. Is it safe to assume that even these poor souls are further tortured by anti-smoking? Second, many of the old buildings, particularly to the east (ie to the left in the above illustration) are very much extant, along with rather nondescript modern two-storey apartment blocks. 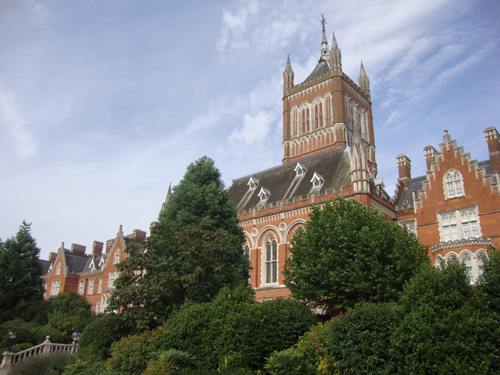 While the old Holloway and Bedlam buildings are beautiful – uplifting even – overall St Bernard’s is decidedly grim and oppressive. Pantopticon-style tower block, de riguer at the time in prison building theory as advocated by Jeremy Bentham. The complex is fronted street-side (the very busy, dual-carriageway Uxbridge Road), by an imposing, ivy-bewigged, arched gatehouse, unoccupied by an employed keeper for many years, by the looks of it. A long driveway leads to the chapel. One can imagine wagons of supplies rolling up here having collected them from the nearby GWR siding, opened a handful of years after the asylum itself which came into being in 1831. This was very much the mid -19C time when the authorities undertook a determined policy of shifting prisons, asylums, workhouses and cemeteries to the outskirts. London was expanding at its fastest pace before or since: no room for criminals, the poor, the dead or the mad. Not quite Victorian, then, strictly speaking by year of foundation, but very much so in many other ways, not least in our imaginations. Wikipedia has a good historical description of this rather desolate Victorian survival. Very good article from Illustrated London News in 1843, republished on Victorian London web site. The correct word is ‘patient’. Not too difficult surely. Many people will experience psychiatric illness either themselves or through a close family member and the reference to ‘inmates’ is unhelpful. When it opened St Bernards represented a new and more enlightened approach to psychiatry – not difficult really compared to what went before. Thanks for putting me straight, Anna, happy to edit on this occasion. 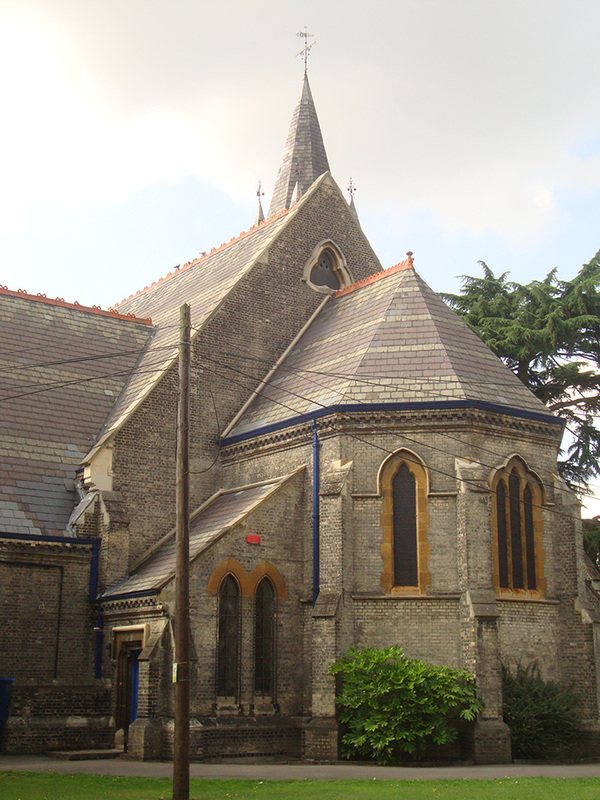 Thanks also for the tip on local walking, we’ll give it a go – Hanwell is a very interesting area. I was talking to a local person about an hour ago who says he thinks the Trust have plans to demolish the remaining old buildings (presumably not the chapel, though). Fascinating. My partner remembers it well. He performed at an entertainment there in about 1960. The routine he performed was the Peter sellers/Sophia Loren Goodneess Gracious song. Afterwards many of he patients followed him round, believing him to be a real doctor. It is interesting that prison building theory was seen as relevant to an asylum. Or any sort of hospital, for that matter. Perhaps the serious gatehouse suggests that security was their top priority! This is a bit guessy on my part, but the design would suggest so. 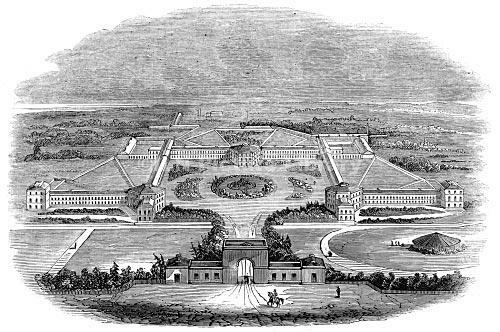 The model prison for this sort of thing was Millbank Penitentiary (now the site of Tate Britain), built only 15 years previously, following Bentham. The builder of Hanwell was one William Cubitt. Infuriatingly there were two men in the profession of this name at this time, and I haven’t figured out which as yet. Hanwell actually demonstrates what can be termed as ‘moral architecture’, as was laid out by reformers such as the Tuke’s at the York Retreat. It bears little resemblance to the Panoptian architectural forms of Bentham, which are far more penitentiary in design. Hello, Martin. Highly unlikely that records of this type would be in the public domain, especially being relatively recent, historically. I’d start by contacting the hospital administration and see what they say. Good luck. Hello Martin, my great uncle died in the hospital in 1956. I would recommend contacting the City of London Metropolitan Archives who hold the archives for the hospital. Be warned though, they may not come up with much information – all patient records for my great uncle had been lost or destroyed and the only paperwork they could find on him was a record of him being admitted, a record on when he died, and a record of his funeral. Very sad that as a family we could not find out what happened to him during his time there. Best of luck – I hope your search proves more fruitful! A distant relative was a nurse there in 1841 when it was called Middlesex Pauper Lunatic Asylum. I would like to know if the staff records exist so I can confirm the link. My grand mother was a nurse there around 1926 would like to find out if any staff records exists I do have photographs of her in uniform have you found any records? My great great grandmother was a patient in Hanwell for 32 years. She died there in 1893 and must have gone through many experiences during that time. That sounds rather sad, but I hope it wasn’t. Are there any buriel records for this establishment? I should imagine there must be some somewhere. I’d be inclined to contact them and ask. Please let me know if you find anything. This paragraph from Wikipedia may help regarding burial records I have just found out my 6x great grandfather died at Hanwell in 1870 so came across your very interesting blog by accident Mike. The friends or relatives of a deceased patient were free to remove the remains for burial. Failing this, the deceased were interred in unmarked paupers’ graves in the hospitals burial ground. With the 1832 Anatomy Act, the body was first kept in a building called the ‘dead house’, on the west side of the burial ground (see diagram above). If unclaimed after 72 hours it could be sold to a licensed anatomy school. The Act also provided for the donation of bodies. Thank you, Sharon. Very interesting, if rather sad. The past was no bed of roses. I hope its okay to post this as a bit of a help to family historians out there. this is part of a response I recently got from the London Metropolitan Archives who hold Hanwell’s records. It will help give an idea what you can expect. “We hold the archives of Hanwell Asylum (which later became St Bernard’s Hospital). If you are able to visit us you are welcome to consult these records without prior appointment. Details of our opening hours, location and History Card registration are available on our website: http://www.cityoflondon.gov.uk/lma. We would suggest that you begin your search by consulting the register of male deaths 1865-1876 (H11/HLL/B/16/003) as this will give you an idea of when Abraham Toy was admitted to Hanwell. When you have that date, you can then search the male admission registers (H11/HLL/B/04/001-005). There is also an extensive series of casebooks which record in detail the nature of patients’ conditions and their treatment in the hospital (H11/HLL/B/20/001-043). Thank-you Sharon. This particular post is quite frequently read as you can see from all the comments, including your earlier one from last year. I’m sure others will find this useful. For I am Aspro, the editor that created the Wikipedia article and spent countless hours of research to put some flesh on the bones of this very ground braking institution. The comments here (and on other websites) leaves me feeling that, that effort was all worth while. Up until that article, the general public knew and could find out little about this institution’s advancements in the treatment of mental health care (pity the modern NHS is now suffering from amnesia). Very interesting All. It looks as if the asylum is being marketed for designer flats now! My grandmother was a nurse about 1901 and so was her sisters is there photos around that time. (2)Your email enquires may not get any useful response but persevere (they get lots of emails). (3) A personal visit may yield better results. Take along all the information you have. Even if your not a historian these places are worth visiting. Also, as a taxpayer these records are your records so you have every right to view them. Take along a digital camera so that you can make copies. Hope this helps in some way. My former fiancé spent 8 weeks here in 1984. He was an alcoholic and went there to detox. There were also patients who were addicted to prescription drugs in the same ward. He had no contact with the outside world for the first two weeks, after which I was able to visit. It was a very daunting place. The addicts were on one floor and there were people on the floor below who had been sectioned and you could hear them occasionally. I found it a very disquieting and daunting place to visit. I am sure it was haunted by the ghosts of patients past. Thanks, Jane. That sounds rather bleak. I hope his stay had positive results. Hi, my ancestor Louisa Jane Dalcho was admitted and died at Hanwell, how can I find out why and where she is interred. Hello Danielle. I think much depends on when this happened. I’m really not sure where one would start with this, but I think there are some helpful comments if you go through them. Hi Danielle if you scroll up the comments you will come across one from me in Feb 2013. 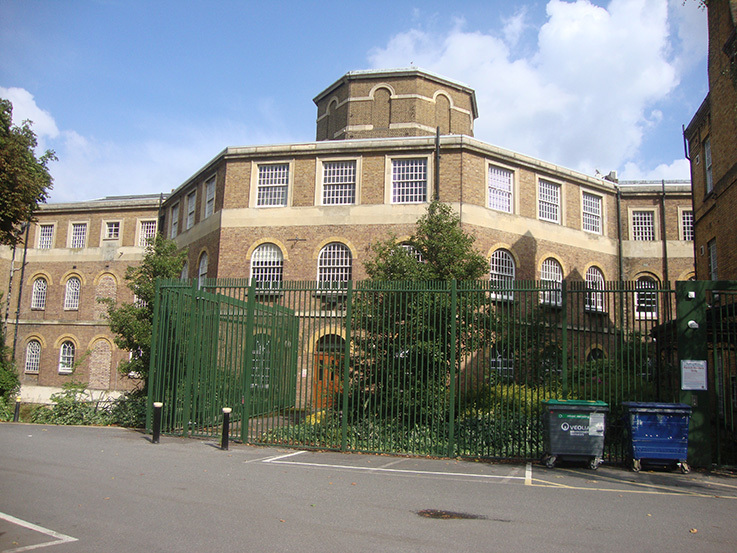 The London Metropolitan Archives hold the records for Hanwell and they have a website but the records are not online. You can go and view them they do a search service but the price of that has gone up a lot recently. I was an inpatient at St Bernard’s for a year in 1978 – 79. I spent most of my time on the ‘admission’ wards in the (now demolished) ‘modern’ single story buildings on the east of the site. My ward was close to the now famous addiction unit run from the hospital. I Life in that unit looked tough from outside. Lots of group meetings and upset people. However,we now know that the treatment was pioneering AND successful so well done St Bernards for developing it. Meanwhile my pre SSRI drug regime and the kind care of my consultants Drs Baruch and Beasley gave me the rest and counsel that i needed to re enter the world. I did have a short experience of the Victorian hospital however. industrial action by staff closed the admission wards for a short time in 1979 (I think that was the date). I was not well enough to be home so spent too weeks in the long stay facility of the hospital. in my depressed condition the architect of the ward seemed very foreboding, but most sad were my co patients. People who had been in the institution for many years and likely to be beyond the scope of return to the community. The ward was unnervingly quiet and I did not cope well with the locked door regime. However, in summary, it is always so interesting to see how we respond to these buildings and their history as ‘outsiders’. My year as a patient at St Bernards taught me many things about my self and others. But mostly a respect for the term Asylum. How fortunate i was to be given the time to make a solid recovery at my own pace, in a place of safety. Thanks, Elizabeth for your first hand account and testimony: a very helpful insight to this article. I hope life has treated you well since that time. My name is Martin Kennedy and my mother Margueritte Cunningham died in the hospital in 1978. I never knew her and have never met her so i am very interested to find out more about her last days alive. I am just wondering if you have sny recollection of her or if you could give me a pointer to how I could find out some information about her.